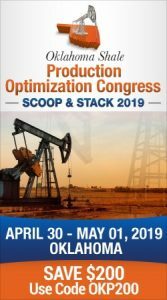 Oklahoma City’s Continental Resources expects to see up to a 19 percent increase in annual crude oil production with a 2019 capital expenditures budget of $2.6 billion. The company predicts the cap-ex budget will generate nearly $3 billion in cash flow from the operations and another $600 million of free cash flow for full-year 2019 based on WTI at $55 a barrel. Management also indicated it expects with that much of a cash flow to reduce net debt to the $5 billion target. At least $2.2 billion will be devoted to drilling and completion activities with 50 percent to be spent in Oklahoma and 50 percent to drilling in the Bakken. However, Continental also plans to carry out its 2019 drilling operations with an average of 25 rigs which is down from the 31 rigs at the end of 2018. But the 25 will also be one more than the 24 rig average for all of 2018. Continental also anticipates completing 307 gross operated wells with first production in 2019 and average 9 completion crews. Continental Resources, Inc. (NYSE: CLR) (the “Company”) today announced a 2019 capital expenditures budget of $2.6 billion, which is focused on both strong free cash flow generation and oil-weighted production growth. Annual crude oil production is projected to grow 13% to 19% and to range between 190,000 to 200,000 barrels of oil (Bo) per day. Annual crude oil volumetric growth is projected to be split approximately equally between the Company’s North and South assets. Annual natural gas production is projected to grow 1% to 4% and to range between 790,000 to 810,000 thousand cubic feet (Mcf) per day. The 2019 capital budget is projected to generate approximately $3.0 billion of cash flow from operations and an estimated $500 to $600 million of free cash flow for full-year 2019 at $55 per barrel WTI and $3.00 per Mcf Henry Hub. This level of cash flow would enable the Company to reduce net debt (non-GAAP) to its $5 billion target. The Company anticipates achieving this debt reduction target late in 2019. The capital budget is projected to be cash neutral in the mid-$40’s per barrel WTI price. 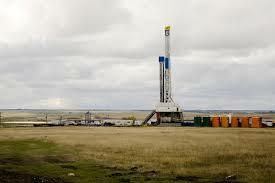 A $5 change per barrel WTI is estimated to impact annual cash flow by $300 million to $325 million. Free cash flow and net debt are non-GAAP measures. See “Non-GAAP Financial Measures” at the end of this press release for definitions and an explanation for how these measures relate to the most comparable U.S. GAAP financial measures. There are currently no oil hedges in place, allowing the Company to fully participate in the upside of oil prices. Natural gas is hedged 110,000 MMBtus per day for first quarter 2019 at an average price of $4.48 and 577,000 MMBtus per day for April through December 2019 at an average price of $2.80. Of the total $2.6 billion capital budget, the Company is allocating approximately $125 million to the previously announced mineral royalty agreement. With a carry structure in place, the Company will recoup $100 million during the year, effectively reducing the Company’s share of total 2019 capital spend by $100 million. The Company expects to earn 50% of total revenue generated from this strategic royalty relationship in 2019. The Company is allocating approximately $2.2 billion to drilling and completion (D&C) activities, of which approximately 50% is allocated to the Bakken and approximately 50% to Oklahoma. Capital allocation to the Bakken is lower than the prior year due to a lower rig count and the timing of drilling large pads later in the year, where completion spend is not expected to occur until 2020. The non-D&C capital is planned to be primarily focused on leasehold, mineral acquisitions, workovers and facilities. In 2019, production expense is projected to be between $3.75 and $4.25 per Boe, reflecting a shift toward oil-weighted production growth. Total G&A is projected to be between $1.70 and $2.00 per Boe. In 2019, production tax is projected to be between 8.0% and 8.3% of net oil and gas revenue. Oil differentials are projected to be in a range of ($4.50) to ($5.50) per Bo, and natural gas differentials are projected to be in a range of $0.00 to ($0.50) per Mcf in 2019. The Company has guided natural gas differentials wider than the prior year based on lower crude oil prices, which impact NGL realizations. The Company has also guided crude oil differentials wider than the prior year but expects improvement based on expanding pipeline infrastructure. The Company is realizing sequential monthly improvement in first quarter 2019. “In 2019, Continental will deliver enhanced capital efficiency with greater oil-weighted production growth coupled with a lower capital spend. The high quality of our assets and operations will drive sustainable free cash flow generation, debt reduction and industry-leading returns,” said Harold Hamm, Chairman and Chief Executive Officer. The Company plans to operate an average of 25 drilling rigs during 2019, down from 31 rigs at year-end 2018 and 1 more rig than the 2018 average of 24 rigs. The Company expects to complete approximately 307 gross (207 net) operated wells with first production in 2019 and average 9 completion crews. In the Bakken, the Company plans to operate an average of 6 drilling rigs during 2019, slightly lower than the 2018 average. The Company expects to complete approximately 166 gross (107 net) operated wells in the Bakken with first production in 2019 and average 4 completion crews. At year-end 2019, the Company expects to have a normal working backlog of approximately 115 gross operated Bakken wells in progress in various stages of completion, of which 45 gross wells are projected to be completed but waiting on first sales. This compares to 137 gross operated Bakken wells in progress at year-end 2018. In Oklahoma, the Company plans to operate an average of 19 drilling rigs during 2019, up 1 rig from the 2018 average, with approximately 12 rigs focused on Project SpringBoard. The Company expects to complete approximately 141 gross (100 net) operated wells in Oklahoma with first production in 2019 and average 5 completion crews. Full-year 2018 production averaged 298,190 Boe per day, up 23% over full-year 2017. Total 2018 production included 168,177 barrels of oil per day, up 21% over full-year 2017. Fourth quarter 2018 production averaged 324,001 Boe per day, up 9% from third quarter 2018. Total production for fourth quarter included 186,934 barrels of oil per day, up 14% over third quarter 2018. As a reminder, the entire fourth quarter and full-year 2018 results will be announced on Monday, February 18, 2019following the usual time for the close of trading on the New York Stock Exchange. The Company will host a conference call on Tuesday, February 19, 2019 at 12:00 p.m. ET (11:00 a.m. CT). For more information, please refer to the previous press release announcing key upcoming events, dated January 23, 2019, or visit www.CLR.com. The Company announced proved reserves of 1.52 billion Boe at December 31, 2018, a 14% increase compared with year-end 2017 proved reserves. The 2018 average SEC oil price was $65.56 per barrel, and the 2018 average SEC natural gas price was $3.10 per MMBtu. Of the 14% increase, only 2% was associated with the increased year-over-year SECcommodity prices. At December 31, 2018, the Company had a Standardized Measure of discounted future net cash flows of $15.7 billion. The Company’s 2018 proved reserves had a PV-10 of $18.7 billion, up 58% year-over-year. PV-10 is a non-GAAP financial measure and generally differs from Standardized Measure, the most directly comparable GAAP financial metric, because it does not include the effects of discounted income taxes on future net revenues of approximately $3.0 billion. See “Non-GAAP Financial Measures” at the end of this press release for further discussion of PV-10. Year-end 2018 proved reserves were 50% crude oil, 85% operated by the Company, and approximately 44% were classified as proved developed producing (PDP). 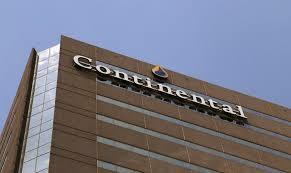 The Bakken accounted for 798 MMBoe, or 52% of Continental’s year-end 2018 proved reserves. SCOOP accounted for 459 MMBoe, or 30% of Continental’s year-end 2018 proved reserves. STACK accounted for 230 MMBoe, or 15% of Continental’s year-end 2018 proved reserves.